Each Atlanta neighborhood offers a unique vibe. Explore attractions, events and more! If you're ready to find your "place to call home" in Intown Atlanta, we invite you to call us at 404-270-9374 or fill out our Contact form here. We look forward to talking with you! Our approach to selling your home is simple, effective and driven by strategic thinking and proven methodologies. We focus on marketing, condition, and price to attract the right buyer willing to pay you top dollar. And our experience in marketing, publishing, photography, and sales adds professional expertise to every step of the transaction. We’re not here to find four walls and a roof. We’re here to help you find a home. “Home” is more than just a roof over your head. It's security, comfort, and sanctuary. It’s the foundation from which you start your day. It's the place you return each night to recharge your mind, body, and spirit. It's where life happens. That's why each housing decision — whether it’s to move to Atlanta, rent, trade up, buy a second home or purchase an investment property — isn’t just a transaction; it’s a significant life change. That’s why, unlike typical real estate agents, we work alongside our clients to help them identify what matters most when finding a place to call home. We love the energy at the heart of Atlanta. Its diverse culture, rich history, modern style, growing population and rapidly-emerging neighborhoods make this an amazing city. The Atlanta Beltline is opening new sections. Piedmont Park is expanding. Turner Field has moved. The CDC, Emory, Coca-Cola, Turner, Georgia Tech, and other major enterprises create a stable employment backbone, while the city also welcomes new businesses into its community. Several Intown neighborhoods are witnessing an influx of housing, restaurants, shopping and population growth, while other "classic," stable Intown neighborhoods stand as beautiful, iconic staples in the midst of a booming and rapidly evolving city. All the while, Google is hard at work bringing new, state-of-the-art fiber optic connections to fuel Atlanta's future. Atlanta real estate can change as quickly as the springtime weather. Our job is to follow the patterns and transformations — and make sure you're up-to-date on the latest Atlanta real estate developments. We work with you to understand what you're searching for in a home — and then help you turn that idea into reality. We embrace a dynamic-yet-practical approach to real estate consulting. The evolving Atlanta real estate market demands expert guidance for buyers, sellers, investors and landlords. We’re here to provide that guidance. 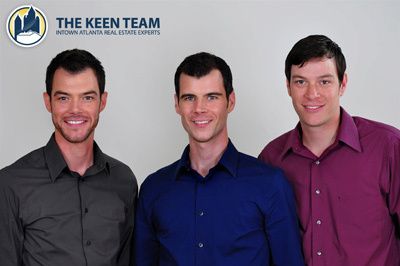 Our goal is to help you find the best home in the best Atlanta neighborhoods at the best price. Because we work by referral, we don’t need to spend valuable time prospecting for new business, and we don’t believe in pressuring people to buy what they don’t need. We’re 100% committed to recognizing your priorities and guiding you through each stage of the process — and beyond. Atlanta Real Estate is a vibrant, evolving marketplace where you need to adapt quickly to stay in front. We learned these skills at a young age. Since our father was in the U.S. Air Force, we moved around a lot as kids. From Germany to England, Wyoming to Florida, we never stayed in the same place very long. Our military upbringing inspired a strong brotherly bond, and it instilled in us the values of teamwork, adventure and striving for top quality — not only in our lives and our business but in our families’ lives and the lives of the people we work with each day. As brothers and business partners, we’ve made a habit of pushing ourselves further and going beyond the ordinary to achieve more. It’s one of the reasons we love the energy and spirit of Intown Atlanta so much: its distinct pace and diverse array of shops, restaurants, and neighborhoods mean there’s always more to do and explore. If you're ready to find your “place to call home” in Atlanta, we invite you to call us at 404 270 9374 or fill out our Contact form here. We look forward to talking with you!